[2013-2016] You've waited patiently since the new year's eve ball fell and 2013 began. You knew Ben & Jerry's flavors where coming, you just didn't know when. Oh the agony of waiting..... well wait no more. 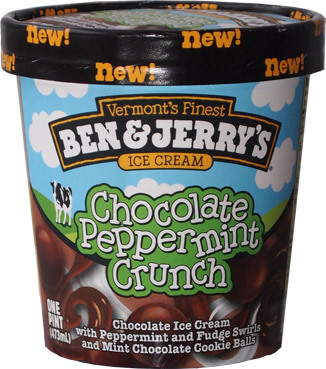 Behold Ben & Jerry's newest full time flavor: Chocolate Peppermint Crunch! Big thanks to Nick for tipping me off that Price Chopper had started to carry these (look for his upcoming review of Coffee Coffee Buzz Buzz Buzz!). I love opening the first new B&J's flavor of the year! 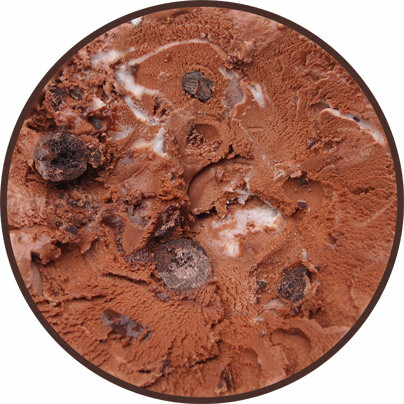 Alright, we've got Chocolate Ice Cream with Peppermint and Fudge Swirls and Mint Chocolate Cookie Balls. It kind of sounds like Schweddy Balls minty brother. Now give yourself a moment to absorb what you are seeing. Those are liquid peppermint swirls, little puddles of fudge sauce, and some very thickly coated mint cookies. This ice cream is coming right at you like so many other classic Ben & Jerry's flavors. I take my first little bite and I see why they call this one peppermint. Then... I take my first big bite and I know why they call this one CRUNCH. In fact, it seems like I'm getting bite after bite of crunch filled goodness. There may not be a cookie ball in literally every bite, but it sure seems like it. We've come to expect wall to wall inclusions from B&J and we've got them here. They've also got a nice thick coating that gives them a strong chocolate flavor as well. I know they sell mix-ins (inclusions) in the scoop shops sometimes and here's hoping you can pick up a bag of these to snack on. There really are two distinct swirls in this pint. The more noticeable one is the peppermint swirl. The awesome news here is that it appears to be the liquid form of the center of a York Peppermint patty. In other words, it's flavorful and sweet, yet not overpowering. It's an awesome familiar flavor and part of me wishes that there was more of it (but would that turn some people off?). It's hard to get the fudge swirl by itself, but it seems real nice and gives a nice blast of flavor randomly throughout the pint. I can't forgot to mention the very rich chocolate base. A dark coloring for B&J's means a deep rich flavor, plus it's got that wonderful texture like most of their other pints. Must have more - must have more - wait, wow, ok, I'm full. This one is fun, I won't argue that. It's firing on all cylinders and all I can really do is let you know that it's as good as it sounds. A lot of companies are rocking mint now and Ben & Jerry's has come to the court with their A game. On Second Scoop: That was quick. I split the rest of the pint with my wife and all was good. 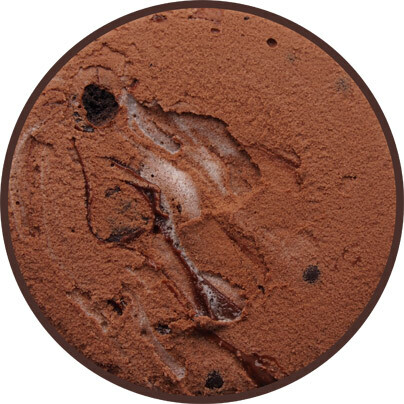 The cookie balls are fun, but it's the rich chocolate base that really sells me on this one. Holy cow. This looks even better than Mint Chocolate Cookie (one of my favorites). I just ate this last night and I have to agree, the base is the star (although I really did love the cookie balls too). I normally hate peppermint but I will probably be buying more of this soon! This flavor just didn't come together with me, even though I love mint and like chocolate; I think the main culprit is the chocolate base, which was just too much (too sweet? too dark?) for me. The peppermint swirl is nice, and the balls do provide a capital crunch. But the chocolate base, combined with the fudge (which would be OK on its own), is just overload. The ice cream lives up to its name, but maybe too much chocolate. @Anon: as a choco lover I adore the base, but I can totally see how a flavor like this might overwhelm. It seems that Ben and Jerry's is running out of ice cream ideas and concentrating more attention to their line of Greek Frozen Yogurts. I was extremely disappointed that only 2 permanent flavors were added to the ice cream line this year and neither were this year's breakthrough flavor, as many claimed "Milk and Cookies" to the breakthrough flavor of 2010. Cannoli is the only decent one this year but even that one was just slightly above average and only a limited batch. Hopefully, we'll see something different than Key Lime Pie and Banana Cream Pie in the limited batch editions later this year. if anything, I think they are getting way too caught up in this exclusive thing. between 7-11 and walgreens and target, they're alienating those that cant get easy access to these flavors. Stride, we already know the limited batch flavors this year. They're pina colada and the candy bar pie one. The latter definitely seems to be the most interesting flavor they're releasing this year that we know of. That is unless there's another exclusive flavor we don't know about yet such as a new target or walmart one. This by far is the best ice cream I have ever had. The peppermint crunch explodes with each bite. I don't eat a lot of ice cream, but I would definately buy this one again. Thank you Ben & Jerry, you hit this one right out of the ballpark!